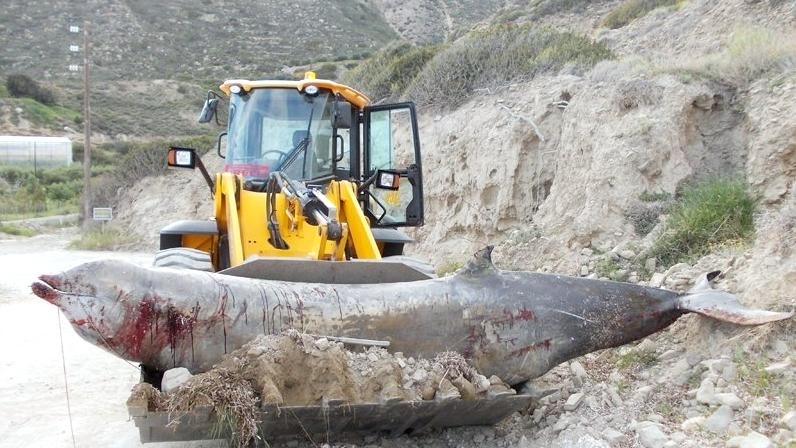 Cuvier’s Beaked Whales get their genus name from the Greek word xiphos which means “sword”, the species name comes from the Latin words cavus and rostrum which mean “hollow” and “beak” respectively. 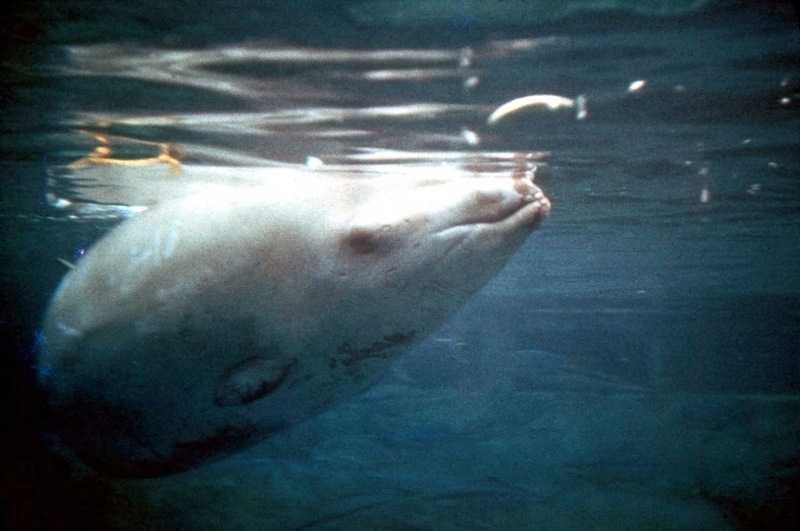 Their name refers to the indentation found on their head just in front of their blowhole. 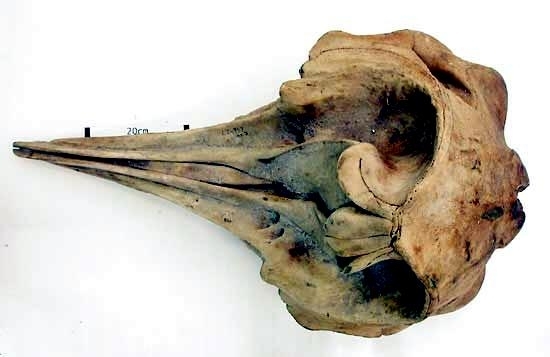 The French anatomist Georges Cuvier in his treatise Sur les Ossemens fossiles (1823), first described the species based on an imperfect skull from the Mediterranean coast of France. 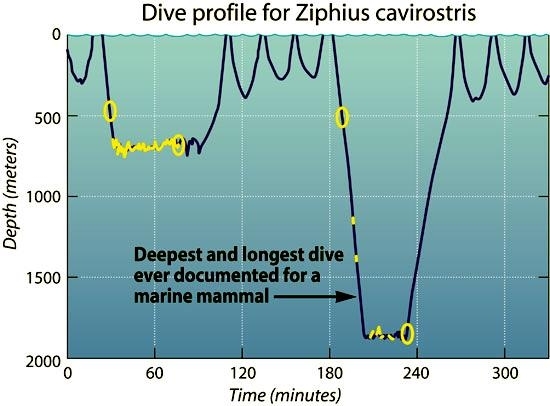 Cuvier named it Ziphius cavirostris, the specific name being derived from the Latin cavus for “hollow” or “concave”, in reference to the deep hollow (the prenarial basin) in the skull, a diagnostic trait of the species. 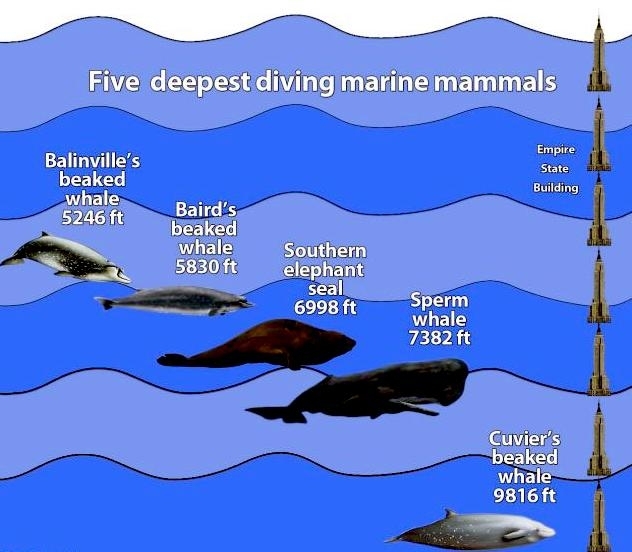 Cuvier believed it to represent the remains of an extinct species. 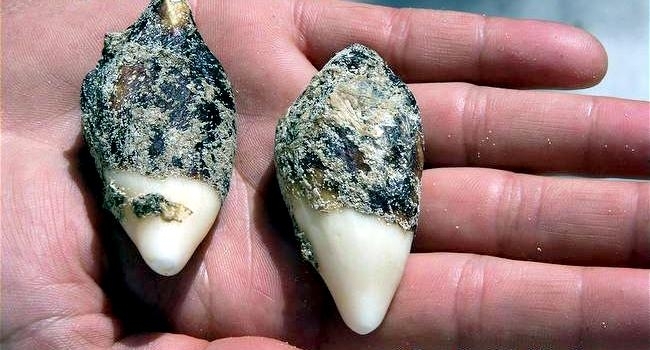 It wasn’t until 1850 that zoologists realized the extant nature of the species, when Paul Gervais compared the type specimen to another that had stranded itself at Aresquiès, Hérault, in May of the same year and found the two to be identical. 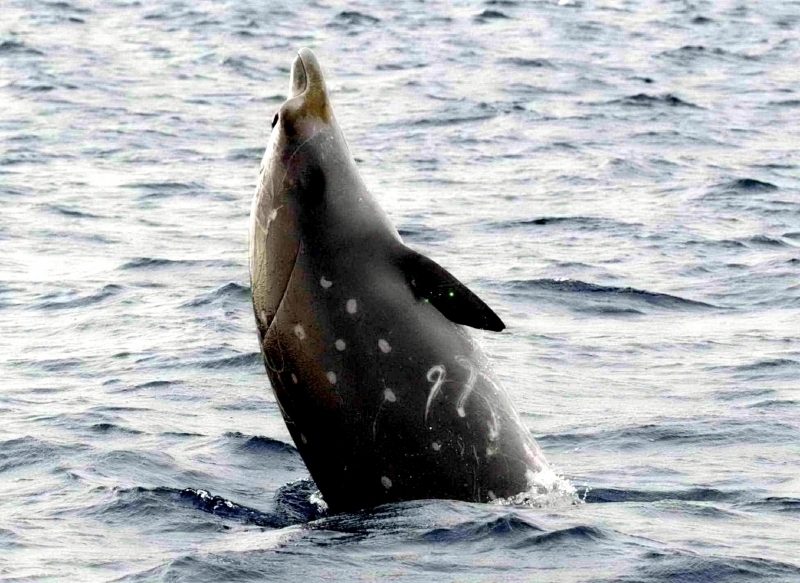 It is thought that Cuvier’s Beaked Whales were the inspiration for the Ziphius or Water-Owl, a creature in medieval folk-lore which had the characteristics of both an owl and a fish. 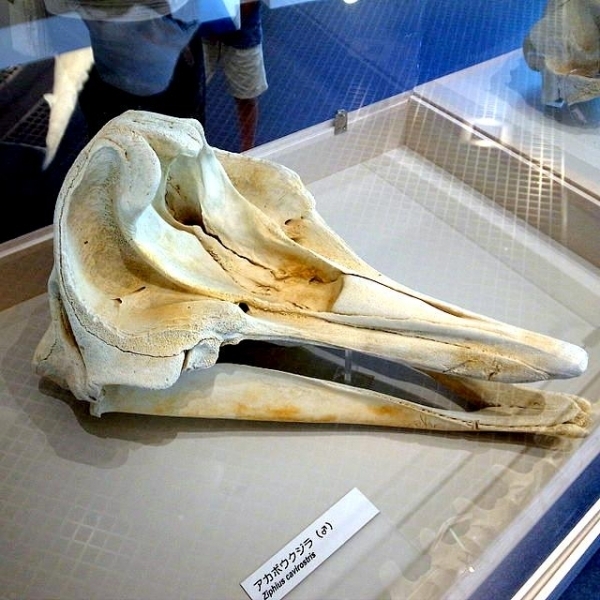 It’s dorsal fin was said to be sword-shaped and pierced ship’s hulls, while the beak was said to resemble an owl’s head. 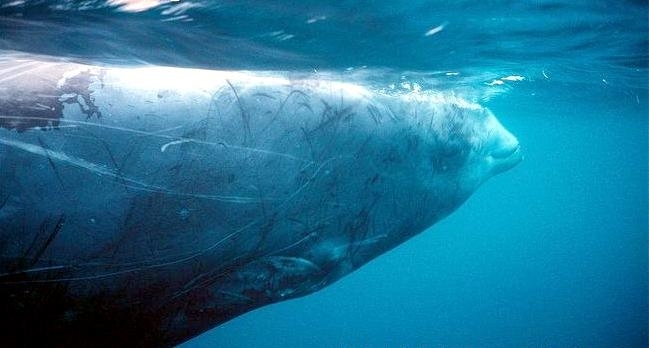 These whales measure 5-7 meters in length and weigh 2,500 kilograms. 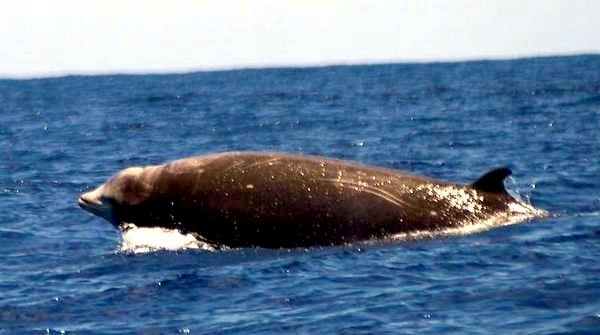 Cuvier’s Beaked Whales have a stout body and small head for their size that slopes down to a short beak and curved mouth, giving Cuvier’s Beaked Whales their characteristic “grin”. 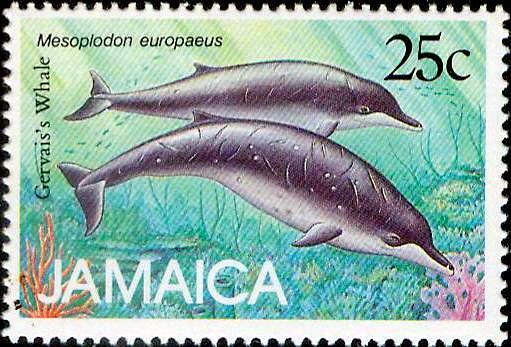 They have small flippers and a curved dorsal fin that measures up to 38 centimeters high. 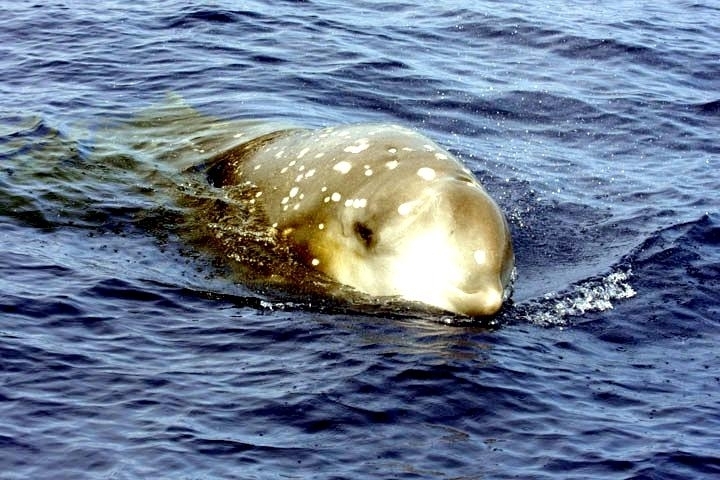 Their flippers like other beaked whales, fold into a slight depression on the lower side of their body streamlining them for faster swimming. 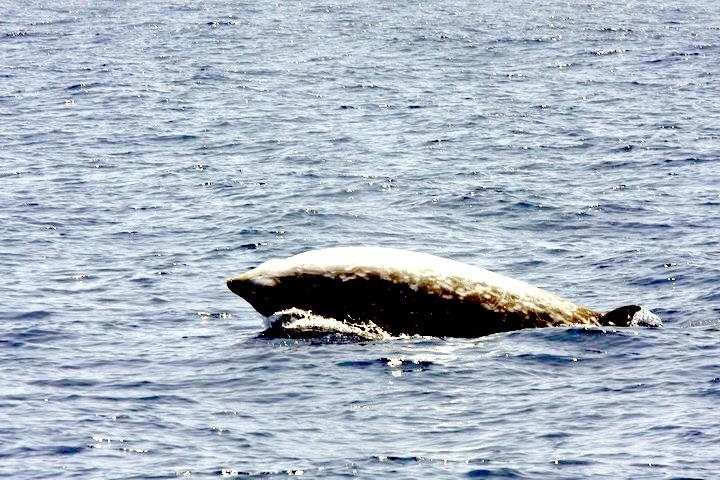 The color of these whales varies, but generally tends to be light to dark brown or gray as adults. 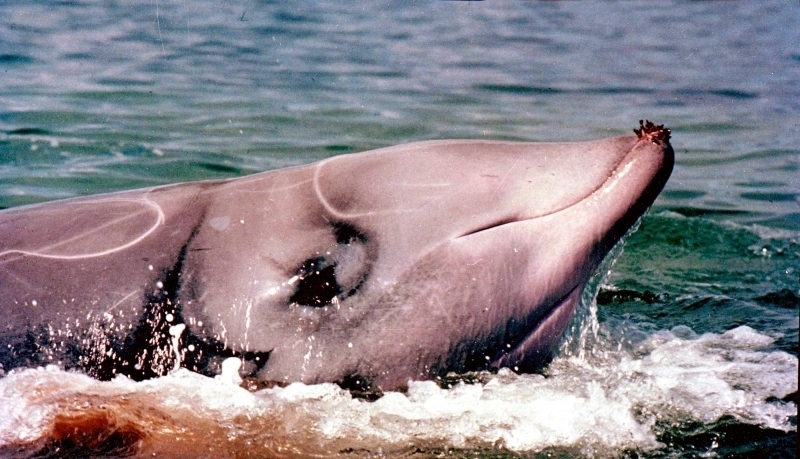 Older males tend to have a white head. 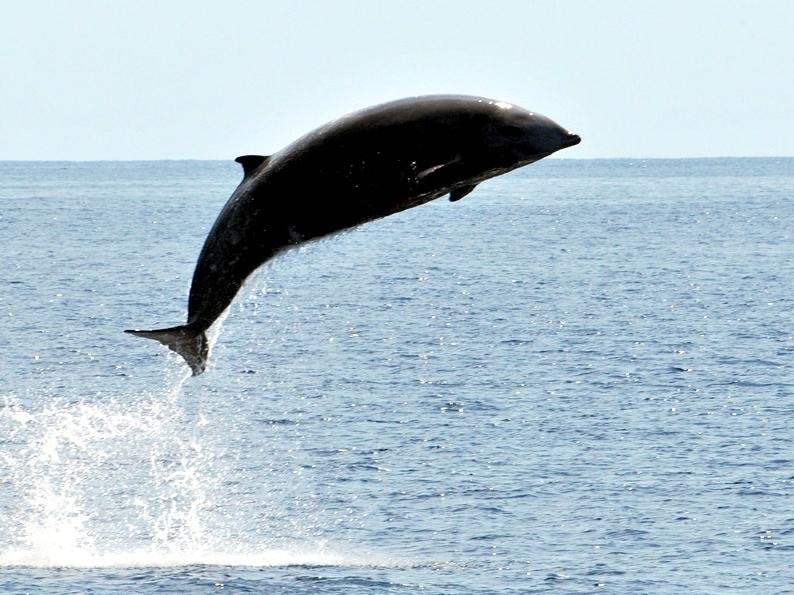 Their ventral (under) side is usually dark brown or dark gray. 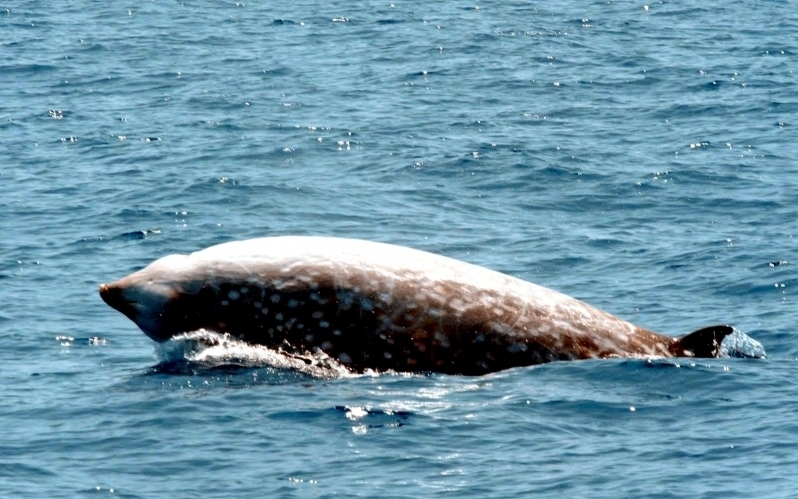 Patterns of lighter colored patches are also present on the bodies of adults. 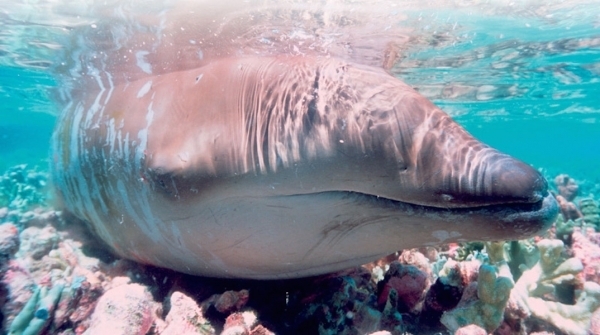 Adult Cuvier’s Beaked Whale males also have 2 large teeth which are about 5 centimeters long that protrude from their lower jaw that are thought to be used during competition for females. 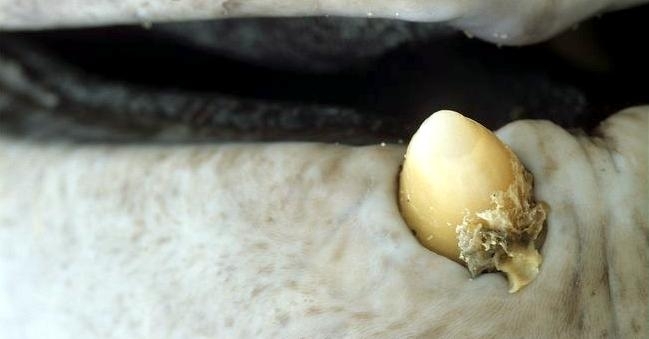 Female teeth do not protrude and are smaller and more pointed. 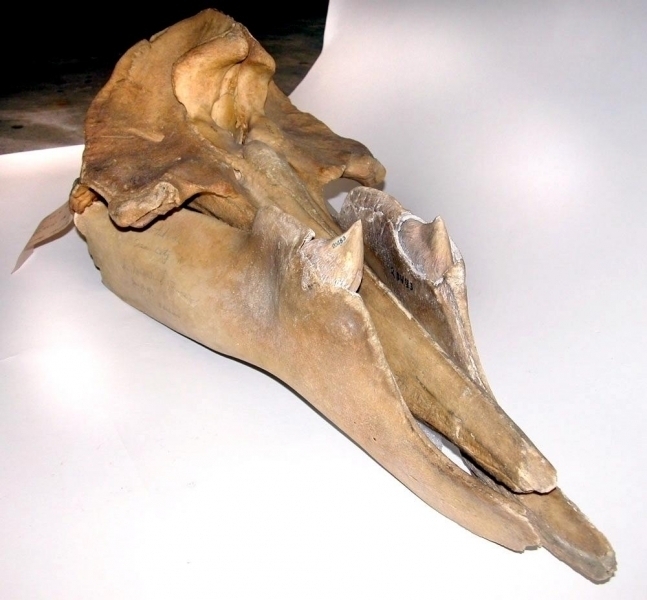 The lower jaw of Cuvier’s Beaked Whales extends beyond their upper jaw and similar to other beaked whales, they have 2 v-shaped throat grooves. 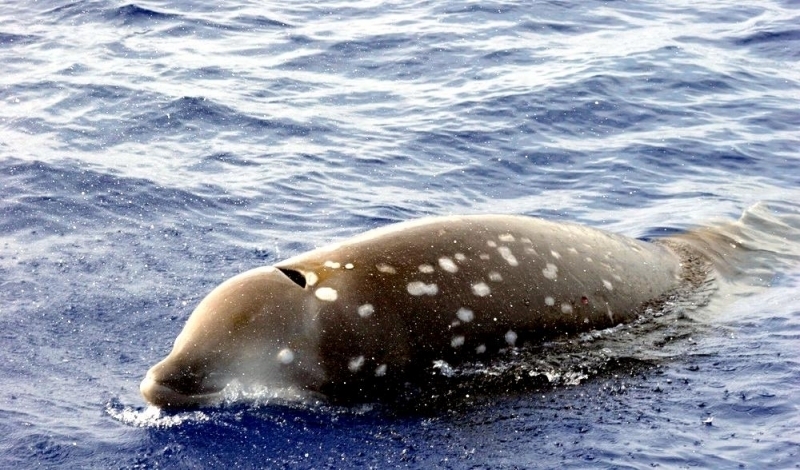 Cuvier’s Beaked Whales are one of the most “common” whales in its family and are found in all temperate and tropical seas, commonly in deep water of the coasts of Japan, Hawaii and New Zealand. 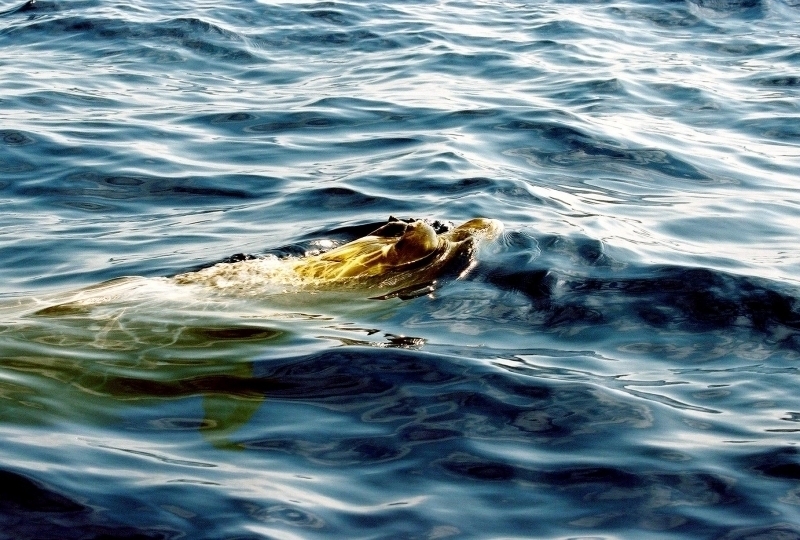 No migration patterns are yet known. 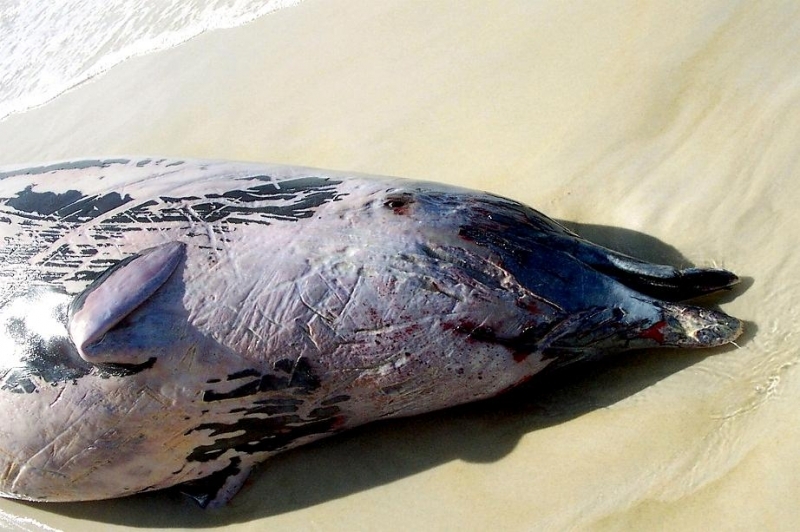 Examinations of the stomach contents of Cuvier’s Beaked Whales have shown that these whales feed on squid and deep-sea fishes. 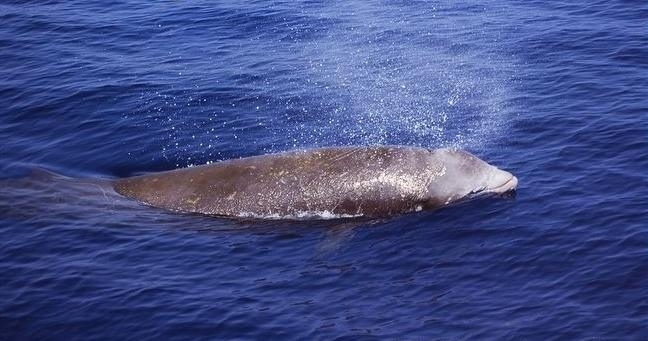 Cuvier’s Beaked Whale females reach sexual maturity at 5.8 meters in length, males at 5.5 meters. 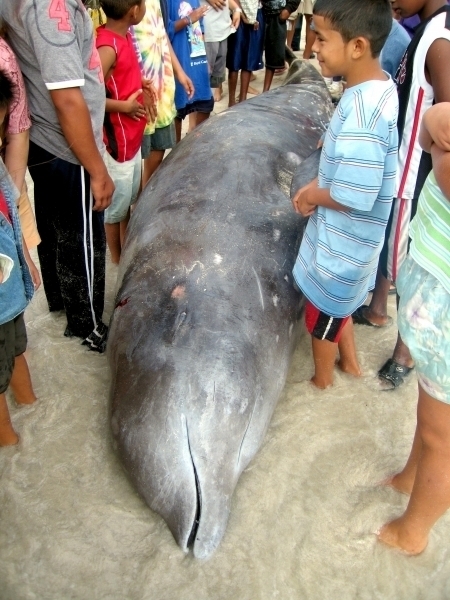 Newborn calves measure 2-3 meters at birth and weigh about 270 kilograms. 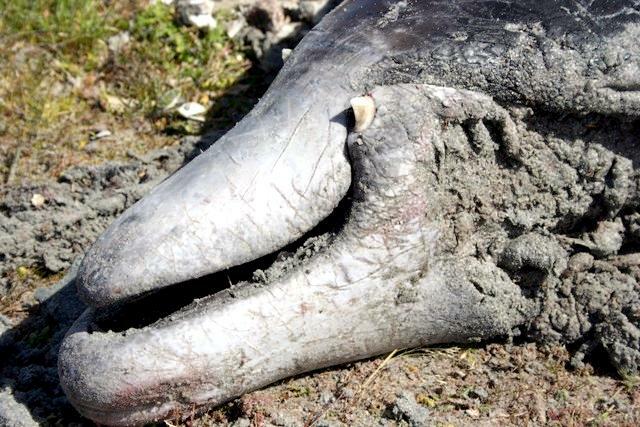 They live up to at least 60 years. 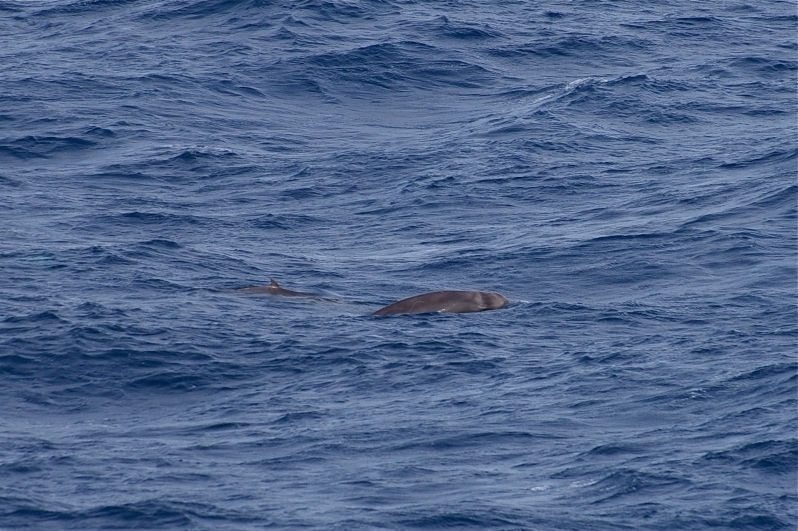 Very little data is available about Cuvier’s Beaked Whales. 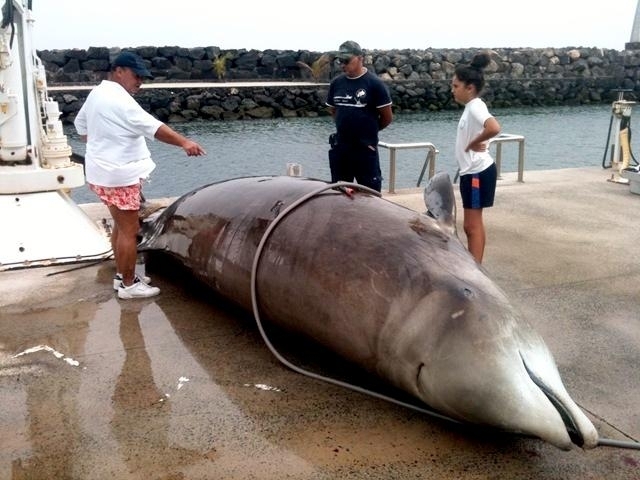 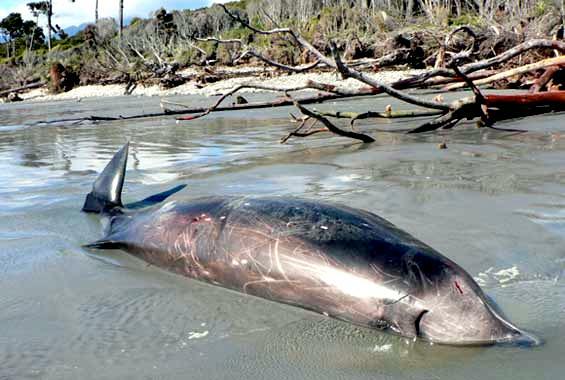 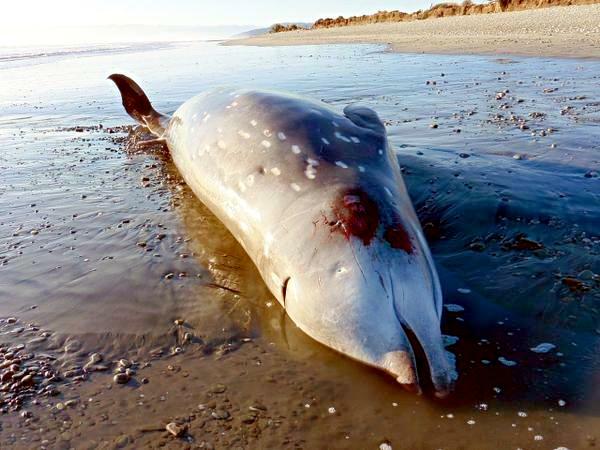 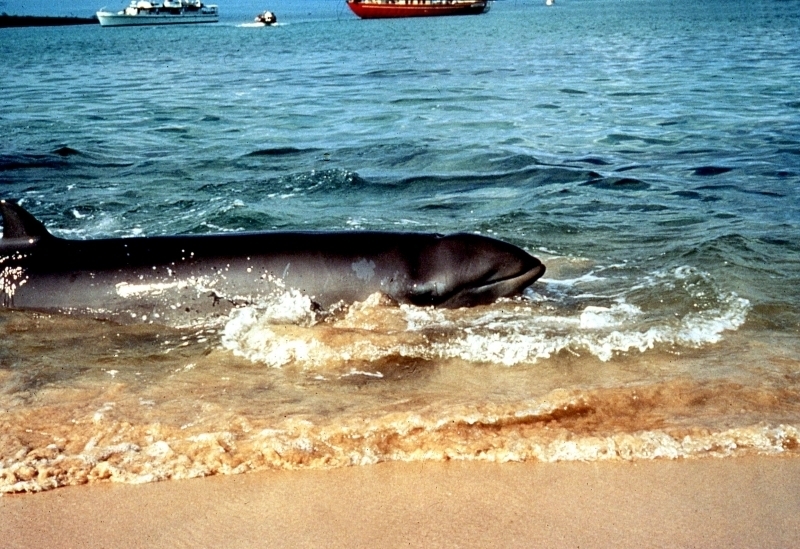 They are found stranded more often than any other species of beaked whales and 2 mass strandings have been reported, one in the Galápagos and the other in Puerto Rico. 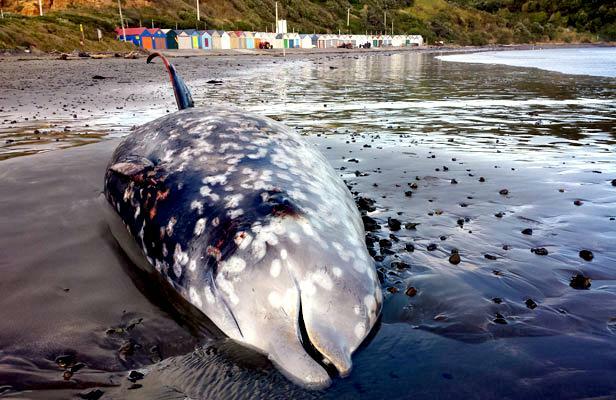 In other regions, Cuvier’s Beaked Whales have been found stranded individually. 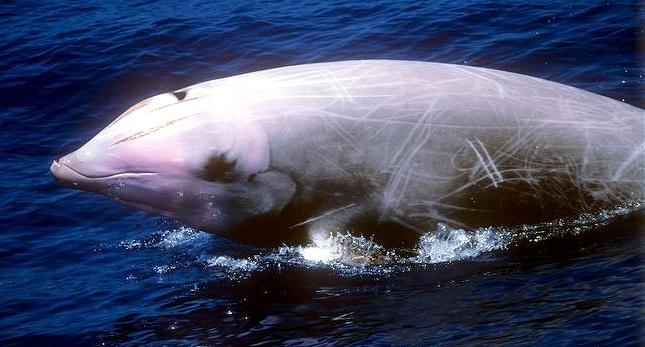 Using a set of advanced satellite tags, researchers were for the first time able to collect data on the whale’s diving patterns confirming what they’ve suspected all along, that the Cuvier’s Beaked Whale is a superlative diver. 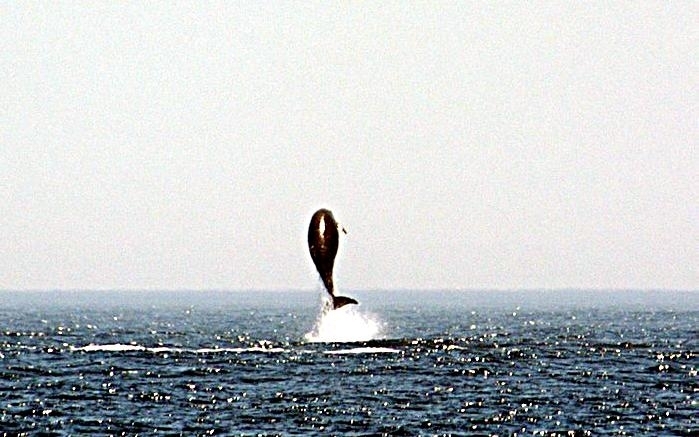 One whale was tracked off the California coast, setting new records for depth & length of dive, clocking in at 137.5 minutes and reaching a depth of 2,992 meters (1.9 miles). 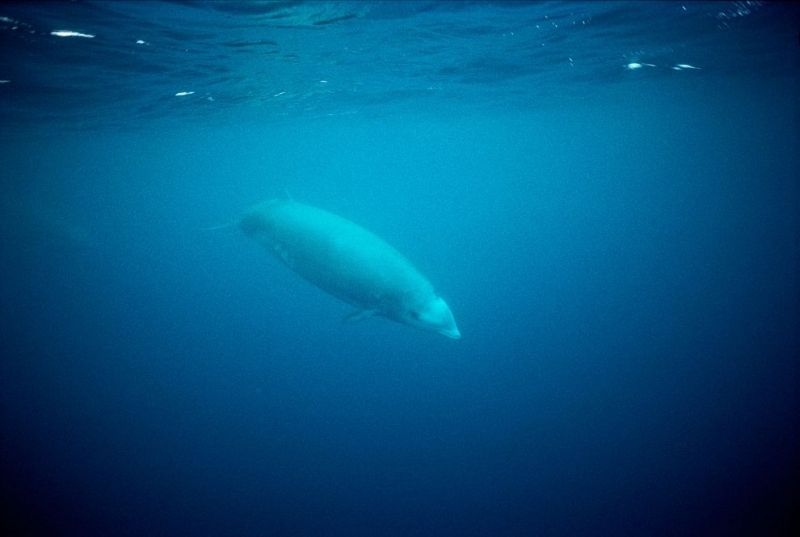 The record-breaking dives of the Cuvier’s Beaked Whale surpass the Southern Elephant Seal, which previously held the position as the marine mammal with the longest, deepest dive on record. 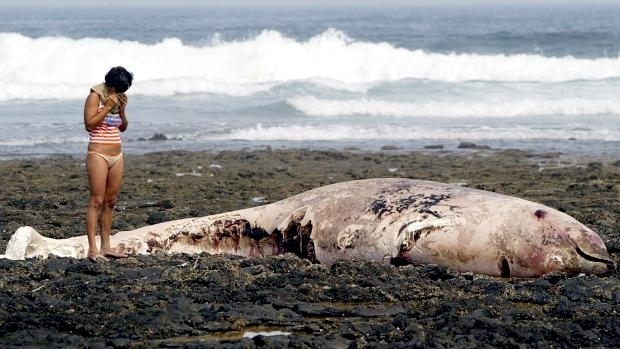 A 2010 study documented one of the seals diving to 2,388 meters (1.5 miles) and a 1992 study times a Southern Elephant Seal’s dive at 120 minutes. 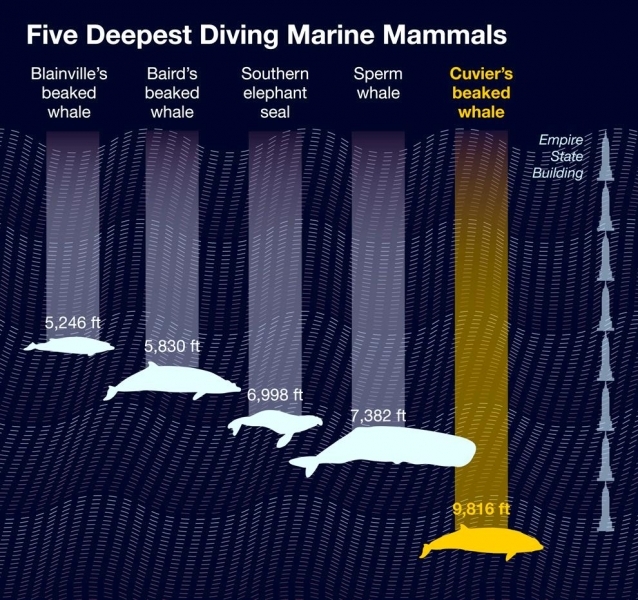 The longest time a human has held their breath underwater is 22 minutes and a person could not even come close to the depths of these deep-diving mammals without being crushed by the intense pressure. 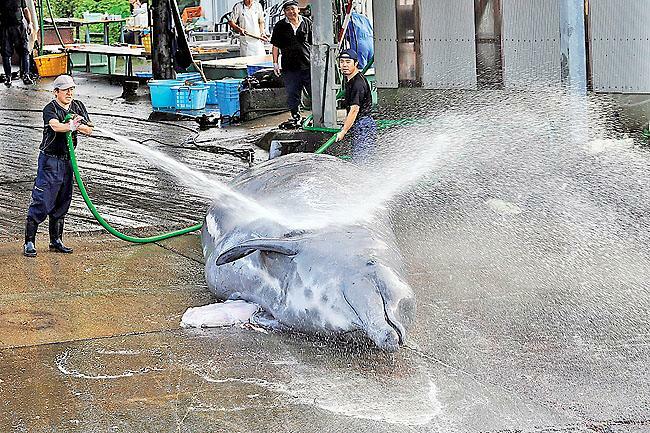 Although these whales have been hunted in the past, so few were caught that their population numbers were likely not significantly effected. 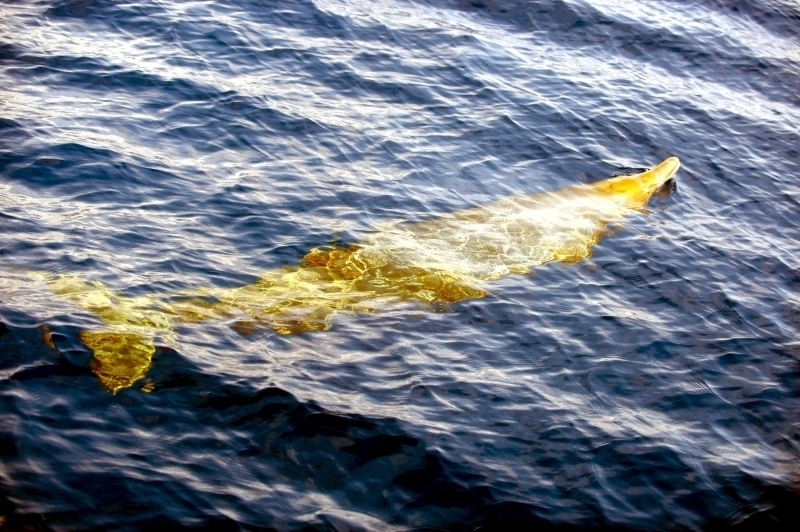 The greatest threat to Cuvier’s Beaked Whales is thought to be acoustic trauma related to human-activated sonar in the Caribbean, Azores Islands and in the Gulf of California.